� In this second New 52 collection, Batman must face the madness of the Mad Hatter, and then take on the Talons of the Court of Owls! But even if he survives that, he must face a whole new set of fears when the Scarecrow returns! Can the Dark Knight overcome the terror the Scarecrow brings? And explore the bizarre similarities between these two enemies and how the idea of fear has shaped their lives! 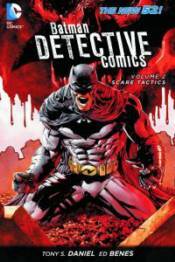 � Collects DETECTIVE COMICS #8-12 and #0, and DETECTIVE COMICS ANNUAL#1.